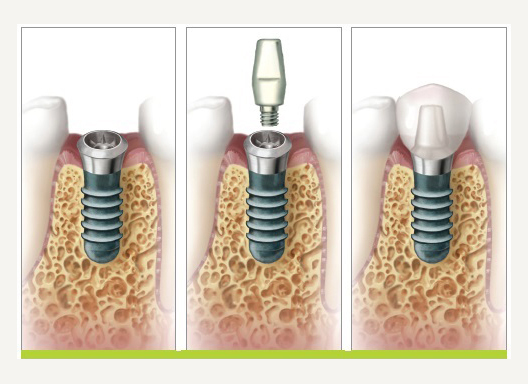 Over the past thirty years, dental implants have been touted as the “best” replacement for failing natural teeth. And while that’s mostly true, there are some factors that can help to ensure more predictable success with implants. Implants are usually recommended after a very compromised tooth is deemed ‘hopeless’ and subsequently extracted. The tooth (most likely) had a previous root canal, multiple previous restorations, and a possible acute or chronic infection. The longer an infected tooth is left in the mouth, the poorer the bone quality in the immediate area. This puts the implant placement at risk, since implants require very healthy bone for long-term success. Even if the surgeon recommends a bone graft to strengthen the bone, that graft also has a better chance of ‘taking’ if the surrounding bone is healthy. The implant process can be more predictably successful if the offending tooth is extracted within a timely manner. Postponing the procedure ultimately only reduces the quality of the surrounding bone. We want your treatment to have the best possible outcome, so we will consistently recommend the hopeless tooth be removed as soon as practical!